A month ago I blogged about how our two oldest have a very early internal clock. They wake up as early as 5am and will not go back to sleep. Not only do their eyes open at this hour so do their mouths. And not just for talking. Because the rule of children is if you are awake you probably should be asking for something to eat. Normally we let them fend for themselves. Capri our 5 year old has learned to make butter, peanut butter, and jam sandwiches (heavy on the butter). Which is great for the most part. But usually they beg for cereal. I really don’t want them pouring out an entire box of cereal each morning in attempts to fill their bowls so I did what any good 1950’s housewife does and bought Tupperware. 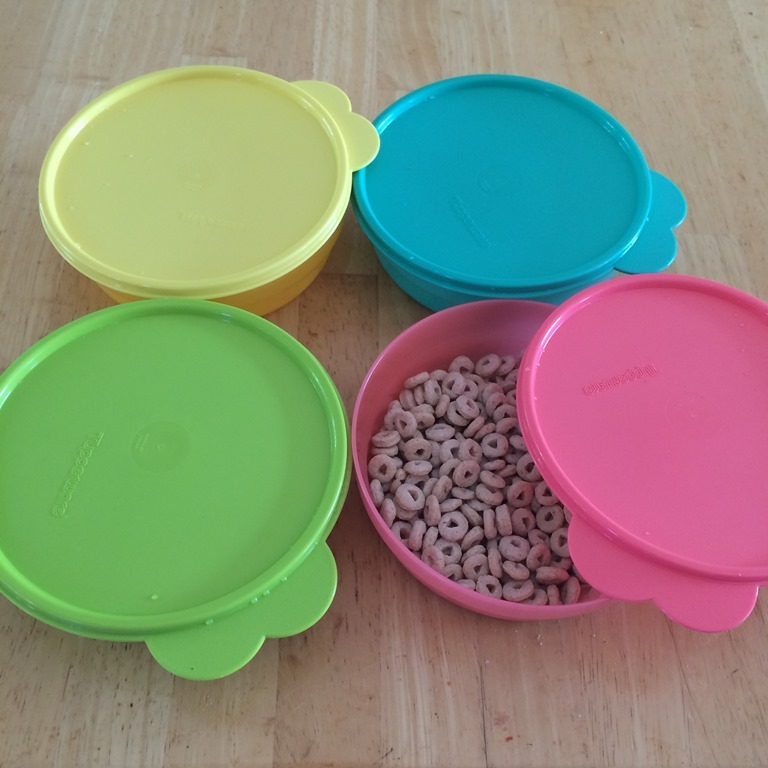 These lovely bowls have lids that are easy to open, but keep their cereal fresh all night long. Oh and also keep the ants out because you know we have been invaded by ants. This is not a product review, this is a for real life situation review. 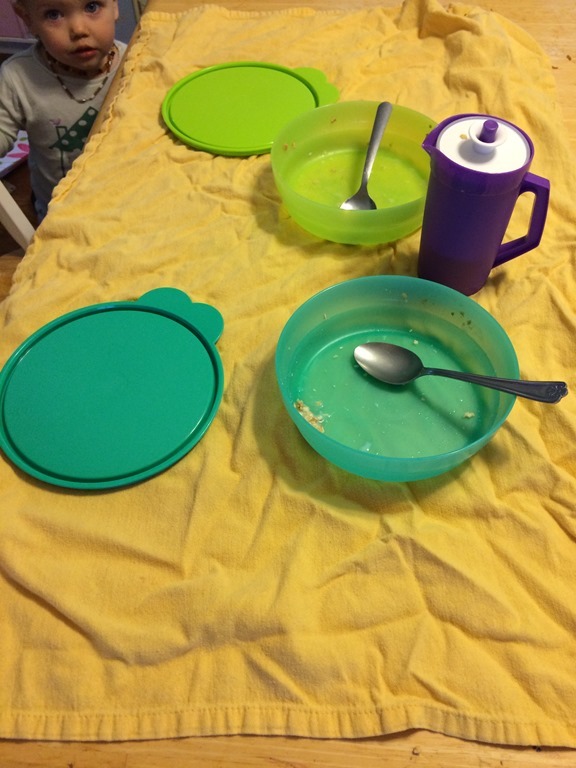 I just leave a bowl out for each kid with a spoon on top (because if they fend for themselves for spoons they like using my measuring spoons). The next problem is that they don’t always want dry cereal and want milk. Well we buy 4L (1 Gallon) jugs of milk, and lets be honest I don’t want anyone but myself or Stefan pouring that. So once again Tupperware to the rescue. I was at a Tupperware party wearing my pearls and heels talking about how I make a killer roast for my hubby and kids…okay I don’t own heels or pearls and Stefan does most of the cooking. But I really was at a Tupperware party. And the Rep had the kids drink tea set thing with her. I saw that little juice jug and I thought to myself…”hey self, that would totally work as a milk jug for little people!! !” So I bought the tea set. Now we already own a tea set, so I use all the other various parts in different ways. The cups and plates stay in our cooler in the van for snacks while out. And the little cake holder and server got added to their existing tea set. Now the pitcher is 8oz, so I fill it half full and put it in the fridge slightly open. Capri knows to pour some on her cereal and some on Payson’s cereal. It is perfect. They love the independence, and I love that if for some reason they spill the milk it is likely less than 4oz, not 4L. The best part is they are all dishwasher safe!! Which means I love them. But really the best part is the girls learning more independence. I love that they can get their own breakfast, and help each other with it. If they would learn that we don’t need them to come in for a play by play of their morning shenanigans every 5 minutes that would be even better. What do you do in your household to foster more independence with your kids? 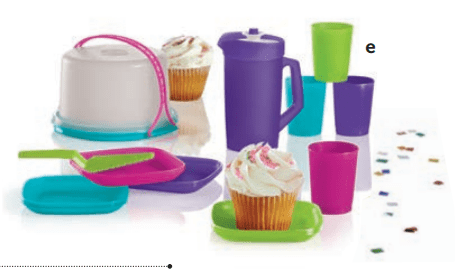 I love the Tupperware set! When I was little, I used to have one like it, but it was brown, orange, yellow, and green. This set is definitely prettier! The best part about my set was that my mom had a grown up sized juice pitcher identical to my kiddie sized one. I felt so cool. This is making me want to get my own for my daughter when she’s bigger.